If you are looking for an automated robotic vacuum cleaner, look no further from the Eufy Robovac 11. With the Eufy Robovac 11, you can start cleaning your home with just a click of the start button and the robotic vacuum will get to business. What’s more, this robotic vacuum features high suction power and other premium features such as its drop sensors, infrared sensors and its 3-point cleaning system. With a lot of good compliments about the Eufy Robovac 11, it’s time for us to get to the bottom of this and understand why this robotic vacuum has captured the hearts of many users. Powerful 1000Pa suction that is fade-free and great for hard floors and thin carpets. Provides a hands-off vacuuming experience, easy to empty and clean. Rave reviews on customer service, with a 1-year warranty. The Eufy Robovac 11 comes with many smart and practical improvements compared to older generations of the Robovac and other robotic vacuums. The larger dustbox, automatic recharging and enhanced sensors are impressive features that differentiate the Eufy Robovac 11 from several existing robotic vacuums in the market. If you do not have medium to high pile carpets at home, this robotic vacuum would be suitable for your everyday home cleaning. Its other cons like the random cleaning paths and inability to program weekly routines are not major deal breakers. 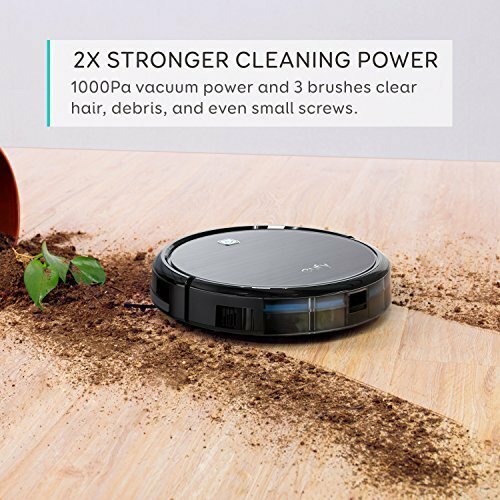 All in all, the Eufy Robovac 11 is a good deal for home users who want to enjoy a relatively effortless vacuuming experience. Here’s a summary of the Eufy Robovac 11’s product features and specifications. 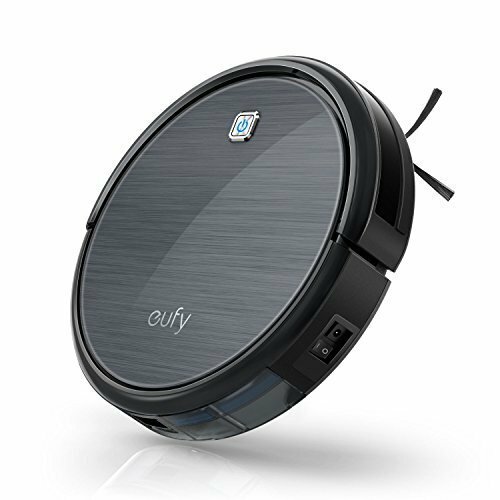 The Eufy Robovac 11 is equipped with a rolling brush, 2 side brushes and a 1000Pa suction power to provide you with a thorough cleaning experience. This r﻿﻿obotic vacuum works by loosening and extracting dirt and debris from the floor, and vacuuming it into the dust collector. What’s remarkable is the Eufy Robovac 11’s quietness at work despite its powerful suction. This is all thanks to its advanced brushless motor design which significantly reduces the vacuuming noise produced by this feisty robotic vacuum. Don’t just take our word for it. Many users have nothing but praises for this robotic vacuum in terms of its noise level during operation. You can check out their reviews online and read about how many customers have operated the Eufy Robovac 11 at home without disturbing other family members who might be sleeping or watching television. So, if you want a robotic vacuum that has impressive suction power minus the noise, the Eufy Robovac 11 is the perfect choice for you. 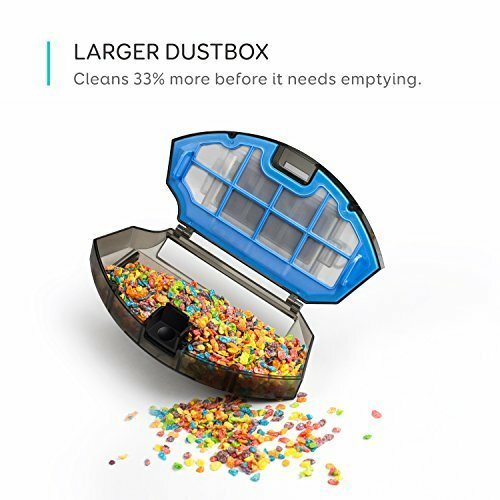 Eufy claims that its Robovac 11 comes with a dustbox that is larger than the average dustbox of typical robotic vacuums. As a comparison, the Robovac 11 dustbox is about 30% bigger than its previous generation, the Robovac 10. This is a handy feature—you don’t have to empty the dustbin so frequently and this makes for a less disruptive vacuuming experience. You can also use the Robovac 11 for more vacuum runs before the dustbox needs to be emptied. This isn’t a particularly ingenious improvement, but it is definitely a practical feature that makes for a convenient cleaning experience with fewer interruptions. The Eufy Robovac 11 is equipped with a high-capacity lithium-ion battery. When fully charged, this robotic vacuum cleans for 1.5 hours fade-free, meaning that users will not experience a decline in suction power even as the battery power gets depleted. Another nifty feature is its ability to recharge automatically. When the Robovac 11 runs out of juice, it automatically docks with its charging base without prompting. Once it’s fully charged, you will be able to deploy the Robovac 11 for its next cleaning task. This is yet another great feature that makes this robotic vaccum a hassle-free helper at home. 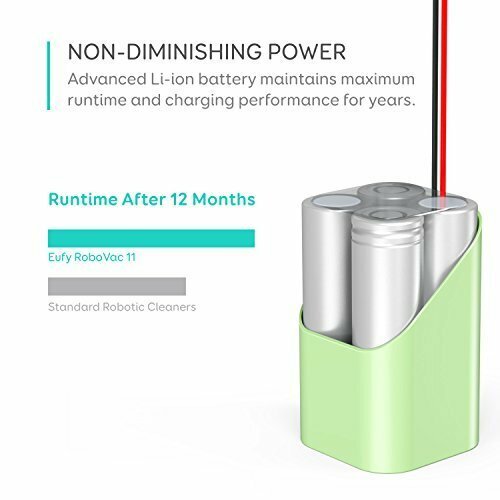 In fact, many users have testified to the reliability of the Robovac 11’s battery and the convenience of the automatic recharging function. 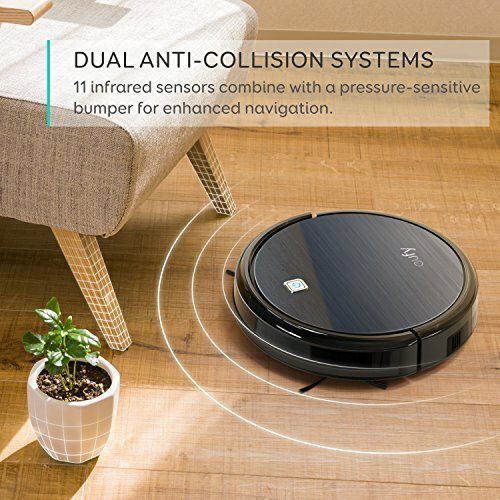 The Eufy Robovac 11’s enhanced sensors are another incredible selling point for this robotic vacuum. Its drop sensors ensure that the Robovac 11 detects drops in height and avoids falls. This means that you can have a worry-free experience when deploying your Robovac 11. This robotic vacuum is smart enough to avoid falling off your stairs or making dangerous moves over a ledge. Its infrared sensors are essentially obstacle sensors that enable the Robovac 11 to avoid household obstacles like toys, furniture and other objects around the house, as well as negotiate uneven flooring. With its great navigation features, you don’t have to worry about the Eufy Robovac 11 getting into trouble when it comes to cleaning hard-to-reach spaces or getting damaged due to falls. For all its pros, there’s bound to be some cons that come with the Eufy Robovac 11. Although the Robovac 11 is equipped with awesome sensors, it does not come with the option of invisible barriers or virtual walls. What this means is that you cannot restrict this robotic vacuum to cleaning one room without having obstacles in place, for example closing the room door. There’s no built-in function that keeps the Robovac 11 from roaming around your room, so if you want to restrict its movement, you will need to have obstacles in place to overcome its random cleaning behaviour. The Eufy Robovac 11 can be programmed to vacuum every day on a daily basis. However, you cannot set the cleaning schedule well ahead of time, say on a weekly basis. You will have to program it every morning or whichever time of the day when you want it to operate on that day. This can be slightly inconvenient. For most Robovac 11 customers, however, this did not seem to be a major deal breaker—it just takes a few minutes every day to set the Robovac 11’s schedule for the day. Eufy has stated that the Robovac 11 is best suited for hard flooring and thin carpets. Indeed, customers who have used this robotic vacuum on medium to high pile carpets have remarked that the Robovac 11 is simply not designed to clean such carpets—it gets stuck pretty often which defeats the purpose of getting a robotic vacuum for hassle-free cleaning. Having considered its pros and cons, we are convinced that the Eufy Robovac 11 is a great buy that’s worthy of its price tag. If you are looking for a reliable automated solution when it comes to cleaning your house, why not consider the Eufy Robovac 11? It may not be one of the big brand names out there when it comes to robotic vacuums, but it sure packs a punch in terms of the features that it’s equipped with. Many customers have also reported being satisfied with the Robovac 11 post-purchase in terms of its durability, performance and after-sales service. Stop hesitating and give the Robovac 11 a go!